https://heartlandva.com/wp-content/uploads/2017/02/Belmont-5-1.jpg 4032 3024 Carlyle Martin /wp-content/themes/heartland/images/logofinal4.png Carlyle Martin2017-10-31 17:13:352017-05-31 17:13:49Winter Is Coming! Energy Efficient Windows Keep You Warm And Your Heating Costs Down. https://heartlandva.com/wp-content/uploads/2017/01/Cooks-Creek-23.jpg 4000 6000 Carlyle Martin /wp-content/themes/heartland/images/logofinal4.png Carlyle Martin2017-08-20 17:11:452017-05-31 17:11:59How To Choose The Right Vinyl Replacement Window For Your Home. Replacement windows are designed specifically to fit into an existing frame in the walls of your home. If you have outdated windows in your home that are drafty, hard to clean or even require painting, it might be time to consider and upgrade. Replacement windows make an immediate impact on the aesthetics of your home and can even improve energy efficiency and save you money. 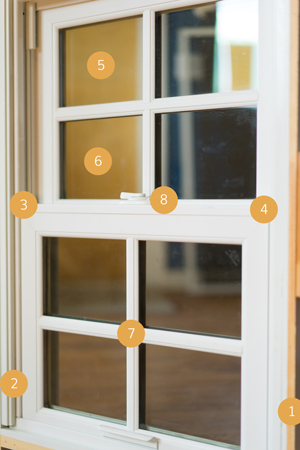 If you’re considering an upgrade in the near future, this post will help you get a grasp on the basics of replacement windows. What’s In A Replacement Window? 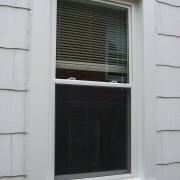 There are several different components that make up replacement windows. 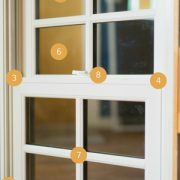 As a potential buyer, knowing what’s in a window allows you to make an informed decision about which features are least important and which features are worth an extra investment. 1. Frame – The frame is the entire support system for the window including the head (top part), sill, (bottom part), and jambs (sides). Unlike windows made for new construction projects, replacement windows are designed specifically to fit into existing frames and trim for minimal disruption during the replacement process. 2. Cladding – A protective layer of cladding is applied to the exterior parts of the window to keep it protected from the elements. Vinyl, fiberglass and aluminum-clad are the most popular choices for replacement windows in newer homes while bare wood is common in restoration projects that require preserving historical details. 3. Sash – The moving part of the frame that holds the glass. 4. Balance Systems (Not Pictured) – The balance systems are mechanisms inside the window that allow it to stay open. Malfunctioning balance systems can result in windows getting jammed or not sliding properly. 5. Glass – Comprised of two or more panes filled with air or argon and sealed to insulate the windows. 6. Low-E Coating – This transparent coating helps your windows reflect heat but let light pass through. It improves the energy efficiency of your windows. 7. Grilles – Decorative pieces on top of the glass that come in a variety of different designs to match your home’s architectural style. 8. Lock – Keeping the window locked ensures maximum efficiency and no air infiltration. 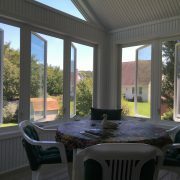 Quality windows will have a continuous inner lock at the meeting rails of the windows. If you’re thinking about installing replacement windows in your home this summer or just want to get some quality advice, call (540).908.2400 to chat with the experts at Heartland Home Improvements today! Sunrooms: Prefab vs. ‘Stick Built’ Construction, What’s The Difference? 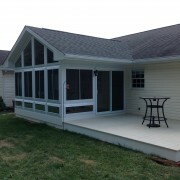 When considering a sunroom addition, many homeowners arrive at this question: what is the difference between a prefabricated or ‘prefab’ sunroom and a traditional ‘stick built’ sunroom? Stick built and prefab sunrooms look very similar as finished products despite the different construction techniques and materials used for each. https://heartlandva.com/wp-content/uploads/2013/12/2013-08-02-14.39.41.jpg 1936 2592 Carlyle Martin /wp-content/themes/heartland/images/logofinal4.png Carlyle Martin2016-05-20 19:27:122016-10-04 12:26:55Sunrooms: Prefab vs. 'Stick Built' Construction, What's The Difference? Replacement windows increase your home’s comfort and value. From impacting energy savings to your ability to control the climate in your home, your windows do more than let in sunlight. Your energy costs, the look of your home, and the health and fit of your windows all factor into the value of your home. Taking the step to replace your windows can revive drafty rooms, open your home to the outside world, or shore up hidden issues caused by loose windows. letting in air when they are closed. Get started with a free, on-site estimate. At our on-site inspection we evaluate your windows and make recommendations with estimates to meet your budget. We’ll talk with you about options and products to best suit your needs, as well as determine if there are any external regulations to consider such as whether your home is in an historic district or part of a Home Owners’ Association. Heartland Home Improvements expertly guides your choices. When replacing windows, you may want to replicate what you have or take the look of your home in a new direction. You have many options to consider starting with materials such as wood, wood laminate, vinyl, and fiberglass. Your style, desired energy efficiency, emphasis on aesthetics, and budget are all part of the conversation. Our goal is your satisfaction with highly functional replacement windows that match the aesthetic of your home. Custom installation means cost efficiency for you. Heartland Home Improvements has the training and experience to know which of the three installation processes is right for your window replacement. 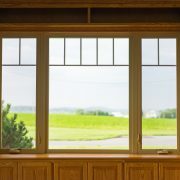 Certain circumstances dictate whether windows can be put in from the inside leaving the exterior intact, from the outside to minimize dust on the inside, or in a total tear out with a rebuild just like it was new construction. Heartland Home Improvements is dedicated to cost-efficient, timely, top-quality service where excellence is in the details. Call today for your free estimate on replacement windows! https://heartlandva.com/wp-content/uploads/2013/12/veiwpoint-3000.jpg 2304 1536 Carlyle Martin /wp-content/themes/heartland/images/logofinal4.png Carlyle Martin2014-02-10 15:12:552016-08-03 13:20:40Replacement windows increase your home’s comfort and value.